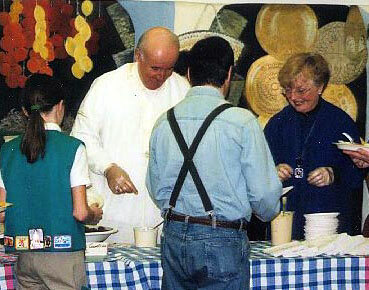 Tunisian English students work with Sue and Gordy Nelson on an art project that was displayed at the Madison Children's Museum. 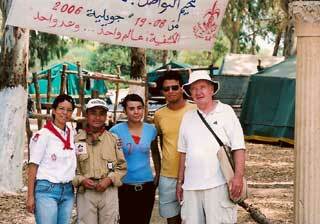 We traveled to Tunisia with art projects from American school children in the summer of 2006. Who Am I?  was the subject the children worked on. We wanted to know about them. What did they like, what do they do, how do they live. 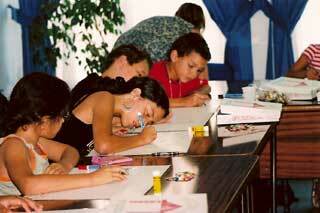 In Tunis, Tunisia, we visited English language classes where students ages 8-12 also did the art projects. The Tunisian children did not see the American posters before working on their own. We talked about what the imagined an American childs life was like. We talked about what we have in common and what differences we might have. When the posters were completed we were surprised to find how very much alike the children see themselves. 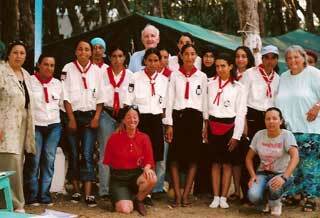 We were pleased to visit many Scout camps in Tunisia where we had a wonderful dialogues with many new friends. At each camp we began with a sharing time where we talked about who we are and what our dreams are. 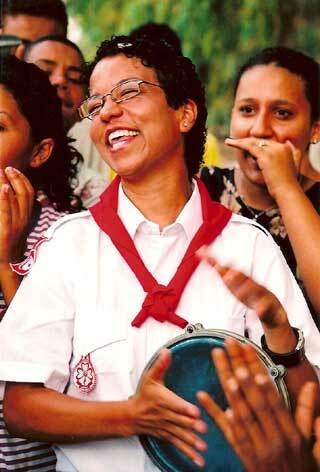 Many of the older Scouts are concerned about world peace. They were surprised that most Americans also want peace. With the dialog opened we hope to continue to work with our new friends, the future citizens of the world. Our new Tunisian friends wanted to know about life in America. When we met these Girl Scouts, together we opened a wonderful dialogue about working together for world peace. In 105 degree Fahrenheit heat, these Scouts find unique ways to have fun. In Tunisian, her name means, Smiles. Her English translation skills helped us a lot. This 12 foot long Medina wall mural was painted by Madison, Wisconsin artist Sabi Atteyih. More than 25,000 thousand people have visited this display. Come in! We'll write your name in Arabic, the sign said. And so they did. Thousands of people have accepted the Habiba Chaouch Foundation's invitation to learn more about the Arab League countries at our Maghrebi Medina Exhibit. The exhibit was developed with donations from individuals and a grant from the Middle East Institute: U.S. Outreach Fund in Washington, D.C.
Thousands of people have accepted the Habiba Chaouch Foundation's invitation to learn more about the Arab League countries at our Maghrebi Medina Exhibit. 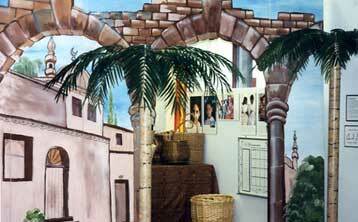 Greeting visitors at the display is a twelve-foot-long, eight-foot-high painting of a medina wall painted by Madison, Wisconsin artist Sabi Atteyih. If you would like to sponsor the Medina exhibit in your community or for more information, please e-mail here or write the Habiba Chaouch Foundation 2424 Andre Ave., Janesville, Wisconsin 53545. In an effort to spread good news about Arab cultures we frequently host a booth at a Food Fest. We have served hummus and flatbread, falafel and baklava. Along with the great food (from Lulus Restaurant in Madison, Wisconsin), attenders were able to try their hand at writing their name in Arabic and learning about "Children around the Arab World" in the mini display. The events are very popular and , funds permitting, we hope to continue doing Food Fests. 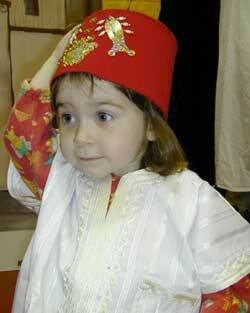 The addition of traditional Arab childrens clothing has been a big hit at the Habiba Foundation display. The addition of 5 colored shishayah, (hats) a jebba, a caftan, a vest, a blouse and a kahshabayah , a jacket has brought more interest to this unique hands-on display. With the help of a mirror, children can see what they look like as they put the clothing on over their own clothing. A twelve by eight foot mural heads the display that has traveled to many schools and fairs and most recently at the Wisconsin Youth Company Common Threads extravaganza at the Monona Terrace in Madison, Wisconsin. The Habiba Foundation display was part of the Cultural Passport Adventure. Children and their parents experience a bit of an Arab culture through this display that opens the door for cultural awareness. Daria peeks into the mirror to see what she looks lke dressed in traditional Arab clothing. She likes what she sees. Many music teachers have programs with songs from different cultures. Most teachers are unfamiliar with any Arab music. We are delighted to be able to offer this at no charge to teachers who are willing to use the song in the classroom. Cameron Powers and Kristina Sophia put the words and music on paper for us. Cameron said An Nadda is generally thought of as a Lebanese song made famous by a singer named Sabah. Some think of it as Syrian in origin. Dabke is a dance of community, often performed at weddings and other joyous occasions. Dabke (also transliterated from the Arabic as debke and dabkeh) is the national dance of Lebanon. It can be danced by men, women, or both, with different steps and different rhythms being more common in different areas of the Middle East. Dabke is a dance of community, often performed at weddings and other joyous occasions. However, it is also a dance of solidarity and a way of expressing nationalism and the age-old presence of art and culture in a positive way. The Dabke leader is supposed to be like a tree, with arms in the air, a proud and upright trunk, and feet that stomp the ground in rhythym, emphasizing their connection to their land. Its meaning in Arabic is stomping of the feet, and stomping, as well as jumping and kicking, are moves that characterize the dabke in a unique manner. Please contact the Habiba Foundation office if you would like this sheet music. See who we are for more information.